We have learned that prostate cancer cells are amazingly adaptable – in fact, they can quickly become resistant to external radiation, making it less effective. That fact underscores our choice of combined radiation therapy whenever possible. We have found that by delivering half the “tumor-cidal” (killing) dose of radiation through an external process and implanting the other half through brachytherapy intensifies the response, giving higher cure rates with lower side effects. Cancers don’t like change! In fact, cross specialty studies looking at breast cancer, colorectal cancer, head and neck cancers, etc. all demonstrate an increasing survival rate when a combination of therapies are used. Patients experiencing recurrence following single modality radiation are often eligible for additional treatment using a different form of radiation. For instance, the man who had EBRT alone may find benefit from a small dose of DART followed immediately by seed implant (depending on the location of the active cancer cells). Men who had seeding (brachytherapy) alone might benefit from additional seeds of a different isotope. If he had Iodine-125 seeds, he might now have Palladium-103 seeds (referred to as a “crossover isotope”), or vice versa, and DART to the surrounding periprostatic tissue and relevant lymph nodes. Again, the important determining factor is pinpointing the location of the active cancer cells. Men with positive lymph nodes may have radiation to the lymph nodes alone using the targeting sophistication of DART. Often these post-radiation recurrent patients will be prescribed hormonal therapy in addition to the new radiation. 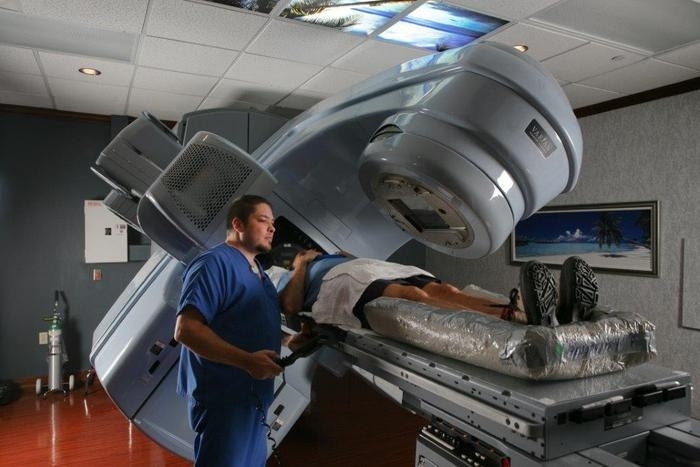 It is possible for these men to have surgery following failed radiation, but in our opinion that would be useless as the spread of cancer is typically not only in the gland but also outside it so that removing the gland would not solve the problem.